This walk: 2014-7-9. Ace of Diamonds enclosure, gert, Warren House Inn, Birch Tor, Sousson's Plantation, Chaw Gulley, bell heather, Challacombe stone rows, Headland Warren Farm, Grimspound, Buckland Beacon, Redwater Brook, buddle, Golden Dagger Mine, wild strawberry, bog asphodel, Vitifer Mine, Birch Tor Mine. Part of the rabbit-proof wall of the Ace of Diamonds enclosure that was used for growing fodder to feed to the rabbits in the winter that were farmed by the local warrener so as to provide meat for the tin miners at the nearby mines (see below). The name comes from the legend about Jan Reynolds being plucked from the church at Widecombe by the Devil for playing with a pack of cards during the Sunday sermon and carrying him off - he dropped the four aces as they went across the sky and they landed as these four enclosures! Part of North Lode or Hambleys Lode gerts, probably the former as it was the first encountered. Further down the site is Chaw Gully ('chaw' was a Dartmoor name for jackdaws) - they used to nest here but were 'shot out' by Jan Hannaford, the farmer at Headland Warren Farm, as being a nuisance that destroyed thatch (for nesting material?). Warren House Inn is indicated at the top right by the 'V' label. Approaching Birch Tor on a cool, windy, grey day in early July! Huddled out of the wind. Chaw Gulley, another tinners' gert. Bell heather, Erica cinerea - also, see HERE. Challacombe Down stone rows ..... fourteen stones were re-erected in an odd disposition at the bottom of the row in 1893, they were possibly dragged down the hill by the 'Old Men' who always respected the antiquities that clashed with their workings, they may be from the lost north end where the figure below shows "gullies" bo doubt dug by the tinners. Another view, note the large terminal stone up the hill. 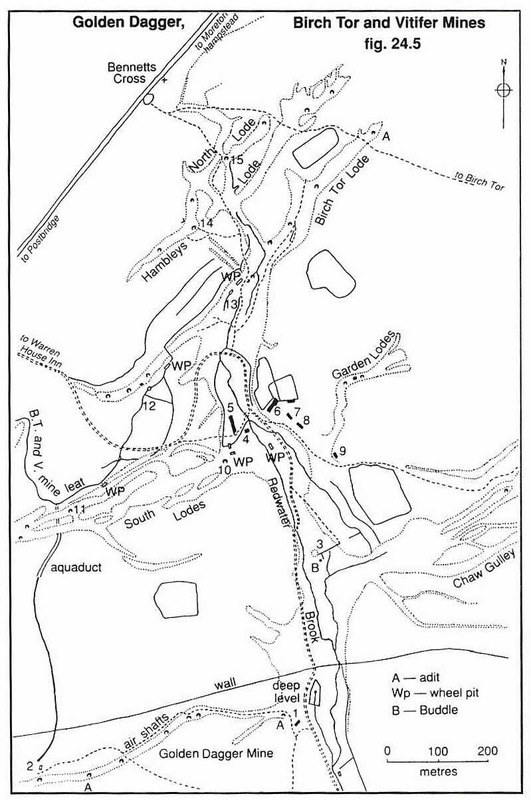 The stone rows are described in detail by J. Butler (1991), Dartmoor Atlas of Antiquities II, The North. 24.3 Challacombe Down stone rows (fig. 23.4), pages 19-20. Similar view with Hookney Tor (left) and Hamel Daown hill (right). 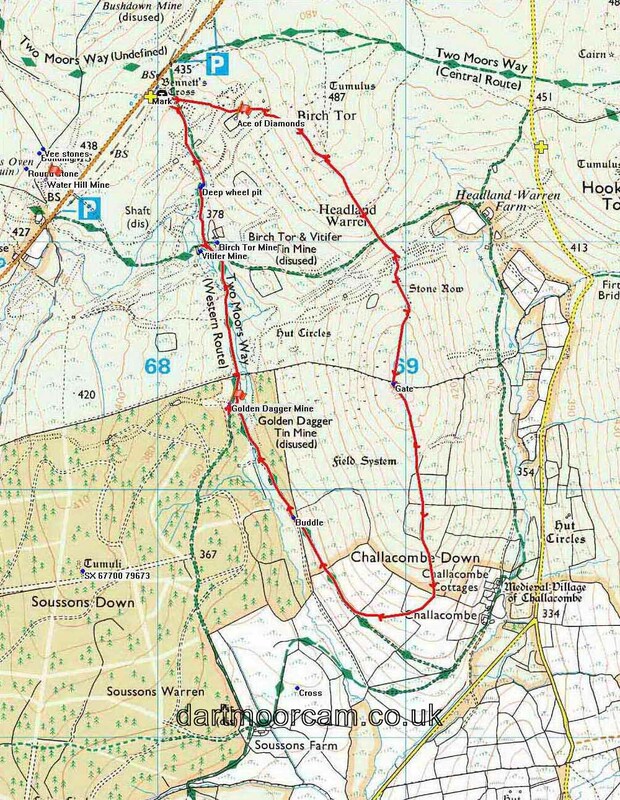 Buckland Beacon, 8.75 km (5.44 miles) distant. Redwater Valley - click on the image to see a video panorama. This area was worked for tin since the 1200/1300s, 800 years of activity ..... "the valley once reverberated to the sound of pick and hammer, iron-shod stamps, and creaking water wheels as the tinners scoured the stream bed and burrowed laboriously into its flanks" (source: Butler, see below). The remains of an old wooden memorial cross. Signpost at the track junction at approx. SX 6832 8038. The carpenter's shop (at right), marked as "4" on the diagram above ..... with the long building behind housing the blacksmith's shop and miners' "dry" ..... this part of the original Vitifer Mine, being on the west bank of the Redwater Brook, earliest reference being 1750. The Birch Tor Mine was on the east bank but they quickly became worked together as the Vitifer and Birch Tor Mine. The area of the kitchen and canteen with a dormitory above, the mine captain's house and cottege ("6" on the diagram above). Further along the track were the mine offices ("7"), a bungalow for miners and their families ("8") and the mine manager's house ("9"). Deep wheelpit ("WP" just above "13" on the diagram above). Distance - 5.76 km / 3.58 miles.